James’ white opponent in the primary spent $5 million of his own money. 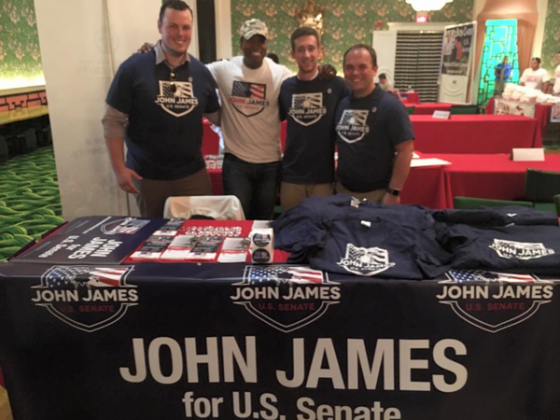 Boldly spouting conservatism, James has pulled ahead with a 7-point lead in the polls. I only brought up James’ opponent’s skin-color because leftists claim white voters will always vote against a black. Folks, we have got to get this guy in there. Beyond James’ obvious assistance in furthering Trump’s agenda, black America desperately needs to see more outspoken black Americans who haven’t drunk the American left’s blacks-are-inferior-children, need-special-concessions and are victims-of-eternally-racist-white-America Kool-Aid. Here’s the deal folks. God gave our nation a reprieve from the expanding tyranny and accelerated cultural rot that would had happened if Hillary were elected. More and more Americans are beginning to realize Trump is simply a concerned citizen who desires to see his country do well; fulfilling her God-given role as the world leader. Trump has firmly put the breaks on the American left’s anti-Christian and anti-America agendas. In an unprecedented display of evil, immorality and lawlessness, the American left’s resistance to Trump has no limits. And this is what makes it so dangerous. Democrats are stealthily spending big, using lies, to drive Republican candidates down in the polls. https://bit.ly/2K2uaxG We must stay engaged in winning the midterm elections to keep the GOP in control of Congress. If Democrats win control of Congress, the huge boot of the American left will slam the breaks and make a sharp u-turn on Trump’s Make America Great Again agenda. A Democrat-controlled House will immediately impeach Trump. My point is the American left have become domestic terrorists; relentlessly selling their lies, hate and deceptions. These enraged Democrats seek to halt Trump’s agenda by any means necessary. Brother and sister Americans, we must keep President Trump behind the steering wheel. For this cause, Mary and I will travel across America working on races with the Conservative Campaign Committee most of this year until after the November midterms. We must keep the GOP in control of Congress.